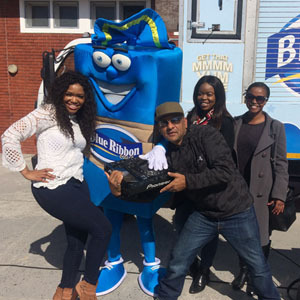 The Mmmm Yum Kidz Tuckshop is a practical vehicle that will teach South African children the fundamentals of business practice. Pupils will learn the basics of business by setting up their own fully stocked pop up tuckshop at their respective school. The road show has finally kicked off and the mentors are ready to get their hands dirty and plant seeds of growth for the youth of Western Cape. Mentors Mishka Patel, TK, Kyeezi, DJ Ready D, Patty Monroe, Blake Williams and Kia Johnson represent a specific school and will each assist the pupils in the 8 week life skills competition. This will culminate in the winning school announcement and prize giving once completed. “In choosing the mentors we really investigated Cape Town’s custodians- as it were- the people who the students can really relate to. The mentors are real people who faced real challenges but made a success of their careers. 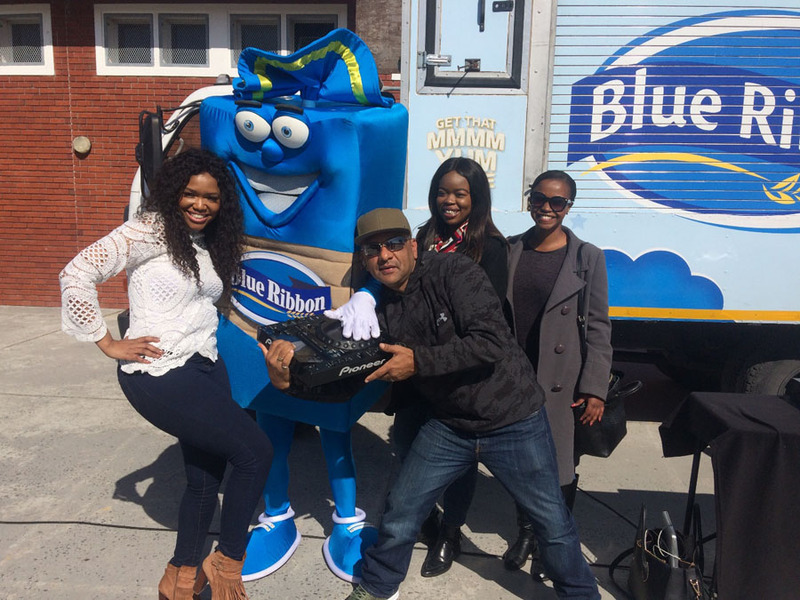 Blue Ribbon believed their stories would resonate with the kids and also help motivate them throughout, even after the campaign.” says Blue Ribbon’s Marketing Executive Bakeries Noleen Ballard- Tremeer. What inspired you to get involved in the initiative? The youth is our future. What we instill in them is what is important. I spend most of my times mentoring 12 & 13 year old girls with my Mishka Patel Success classes. Speaking to them about goal orientation, inspiring them to have stronger and more positive mindsets, we do vision boards so that they can have their dreams visualized – to name a few. It’s the small things that can change a life. Change a child. Building my own business changed my life. Entrepreneurship is such a valuable asset to society, creating work for others. The necessity and importance of entrepreneurship is almost underrated today and it definitely needs maximum push and support among our youth. I was (and am) so inspired by this amazing initiative, so that we can make it popular as a career option, stimulate creativity and plant a seed of empowerment and love for entrepreneurship. To be given the opportunity to encourage the youth is a huge plus for me. I’m a child’s rights and human trafficking activist. I also believe education is key and a good foundation is vitally important when you are still very young. Moulding and motivating the youth to become the best version of themselves they can be is such an honour. The main motivator for me was being presented the opportunity to be a part of an initiative to see young people succeed. It’s important to highlight and give them insight into the world of entrepreneurship. I am very passionate about business and I encourage the importance of being an entrepreneur at a young age. This platform will spark the dream for many young learners wanting to become successful. I live to inspire the youth of today to become the best they can be and this initiative allows young individuals to start a new life journey to develop a successful mindset. My experience has been nothing short of amazing. I visited Bongolethu Primary in Phillipi and the kids were extremely excited to launch this campaign at their school. I was also blown away by the dance moves some of the kids showed off in the dance competition. When I was in Junior school, we did something very similar. I learnt a lot about business and am so happy to be apart of that learning for a new generation. The experience so far has been amazing, the kids at Heideveld Primary were an absolute pleasure to be around. My family is originally from the location of Gugulethu in Cape Town. My father has always spoken to me about giving back and making sure that knowledge is shared. This initiative is a great platform to empower young kids to believe in themselves from a young age. I think in the years to come we will see more entrepreneurs emerging from these communities so it’s only right that we share knowledge and skills. What are you hoping to achieve by mentoring the pupils? To teach them the importance of opportunities, as that is what entrepreneurship promotes and creates. The creation of business and work opportunities. Entrepreneurs are highly motivated, action oriented and ready to achieve massive goals. It’s a mindset. I would love for them to aspire to be driven enough to create great opportunities for themselves, but most importantly, with what they have. My biggest hope is to achieve a strong rise of passion and commitment to the world of business, especially among the girl children. I hope that the youngsters are excited by the idea of being their own boss and the drivers of their own destiny. productive that they can turn their dreams into a reality. I am hoping that my interactions and experience will have a positive impact on the youth and that they are able to extract lessons from my story as a music industry personality and use it in their life’s journey. I have this quote that I live by, “If you see a man for what he is that is all that he will ever be, but if you see a man for his potential, that is what he will become.” I aim to see the students for their potential until they see it in themselves. I’m hoping to encourage at least 5 students to start their own business and I will share my business experience with them. Hoping to be able to give back, I was blessed to have some amazing mentors around me, I hope I can be just as amazing. My main goal is to have the kids believing in themselves. Like I mentioned, if we can have more kids believing in their abilities in the years to come I believe we will see some serious changes within our communities. The objective is to start early, and this is a great way of investing into our future in South Africa. With the high unemployment rate of the youth and lack of entrepreneurial and financial literacy in our schools it is important to have such initiatives to make sure that we teach the children such skills at a young age so that when they grow up they will be able to create employment for themselves and make sound financial decisions. To give them skills that will help them become financially savvy and to be able to make better financial decisions in the future.